Wind damage to a roof (especially a commercial roof) can be just as damaging as, if not more damaging than, damage caused by hail. Damaging winds, defined as winds exceeding 50–60 mph, account for half of all severe weather reports in the lower 48 states. Although hail is often viewed (especially here in North Texas) as the greatest threat to your roof, wind damage is absolutely something you should be thinking about, especially after a severe storm comes through North Texas. The reason is simple—damage caused by wind can be much subtler than damage caused by hail, and it is often difficult to diagnose. As with any roofing damage, the most obvious sign that your roof has been damaged is a leak. If you’re fortunate, you’ll notice the leak right away, but many leaks go unnoticed for days, weeks, months, or even years. However, even if damage to your roof doesn’t cause a leak, it can still be an issue. When storm damage (including hail damage and wind damage) is heavy enough to damage your roof but not cause a leak (which can happen for a variety of reasons), the structural integrity of your roof can be compromised. You may have no clue that your roof has been weakened by wind damage until much further down the road. Why does this matter? Because Dallas-Fort Worth has an entire season of storms every year, a season that can last for 8 months out of the year or more. Because it’s hard to know what to look for. The same can’t always be said of wind. Wind is not an object, so it doesn’t leave any sort of mark (because no impact is taking place). When there is an impact (from the wind propelling an object into your building), it can be easy to mistake that impact for hail damage, discounting the role the wind played. Wind damages in a variety of other ways as well, ways that are not immediately identifiable as wind damage. Severe winds can also increase the damage to your roof from hail. Remember, when hail damages your building, it’s not falling straight down—it’s being propelled by the wind of the storm. That’s why impacts by objects or debris and impacts from hail can look very similar—they’re being propelled at similar speeds. The higher the winds in a storm, the worse the damage from the hail. Two storms with hail of identical size can cause very different levels of damage, depending on wind speed. 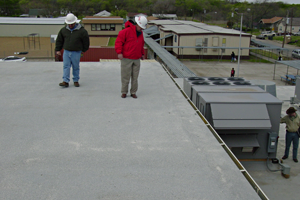 Even when a storm doesn’t have hail, wind can cause a variety of other problems, many of which look extraordinarily similar to simple wear and tear, problems like wind uplift (where portions of the roof are lifting up from their attachment points on your roof, or even lifted off your roof completely) and wind scouring (a phenomenon where gravel or other portions of your roof are blown off) can look confusingly similar to normal roof aging. Again, this is why you want an expert looking at your commercial roof, someone who has repaired wind damage to commercial roofs for years, someone who can tell the difference between a variety of types of damages (and recommend the best solution to fix those damages). When a severe storm comes through your area, even if you don’t notice any obvious damage, it’s important to inspect your roof. This is one of the real benefits to having an expert walk your roof after a storm or after you discover a leak, or even just once a year: they know what signs to look for to diagnose damage, but, if they know what they’re doing, they’re doing a little detective work before hand. The savvy expert will know, before they even get to your property, what kind of storms have come through the area recently, what kind of wind damage is possible given the type of storm, if tornados were sighted nearby, what type and size of hail fell during the storm, average wind speeds, and even how much rain fell—all this is critical to diagnosing the extent of the damage. Even the composition of hail can change, depending on a variety of factors, from a consistency similar to a snowcone all the way to ice as hard as a rock. Investigating how hail or wind has damaged a roof requires training, experience, and an eye for detail. 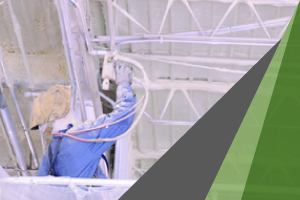 Make sure any expert you hire to investigate potential or actual damage to your roof can provide you with examples of their experience and has been trained to investigate wind and hail damage. 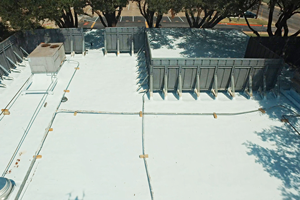 Storm season is here in DFW—Is your roof prepared? 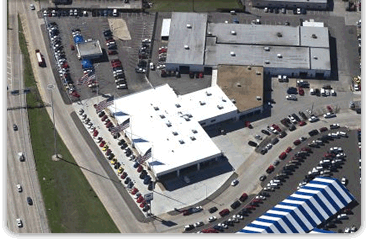 Click here to contact us about a free estimate on a durable spray polyurethane commercial roof. Winds are always problems for commercial roofs great tips and advice for anyone who owns a building! Agreed. Thank you so much for reading!